It is notoriously difficult to predict when a comet is going to give a good show. They might not produce as much dust as expected or not be as bright for some other reason. It's almost impossible to see them when they are not close to the Sun too. As of 1995 there were 878 known comets, 184 of which are known to be periodic, so are expected to come back at some time. Of course a comet could appear that has never been seen before, in which case you get little warning, so cannot predict that. There are some comets in the sky now, they are just very faint. Check out Cometography.com or http://www.cometwatch.co.uk/ for information on comets currently in the sky. Feb 2004 Update There was a comet that was discovered in December 2000 that had the potential to be quite bright (ie. visible with the naked eye) by July or August 2001 which has the snappy name of: C/2000 WM1! It didn't get very bright though (thus proving how hard it is to predict). 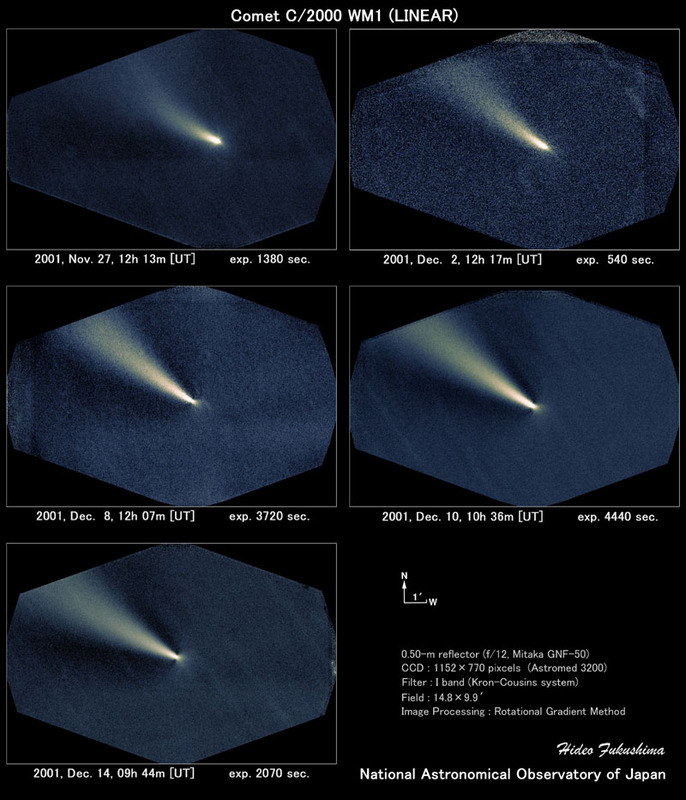 Today, Comet C/2002 T7 (LINEAR) is featured on APOD. Some people think this one might be very bright by May 2004. We'll see! Sept 2004 Update. Well LINEAR didn't get that bright, but it did become historic, in that it was one of three comets observable in the northern sky at the same time - the most ever in recorded history!